Genetic, genealogical and circumstantial evidence accumulated by the Acree Surname DNA Project, indicates that most Acrees living in the U.S. descend from a common ancestor named William Acree, who was born about 1710 and settled in Hanover Co., Virginia, about 1730, probably as a recent immigrant from the English/Scottish "borders" area (see below). He died about 1767, when he was succeeded in county affairs by his son, Joshua, whose four brothers had moved away. Our evidence also indicates that a substantial minority of Acrees living in the U.S. descend from a different William Acree, genetically unrelated to the above progenitor, who was born in Frederick Co., Maryland, in 1752 and migrated as a youth with his widowed mother to Guilford Co., North Carolina, in the mid 1760s. After serving in the Revolutionary War, he migrated with his extended family to Wayne Co., Kentucky, in about 1804 and died there in 1833. On the basis of DNA and circumstantial evidence, it has been deduced that this second William was a member of an Akers family that may have descended from an Akridge family, also of British origin. Our evidence indicates further that many Acrees living in the U.S. descend from Jacob Acra (c1710-1772) of Middlesex Co., Virginia, about whom little is known. Genetically unrelated to both of the above Williams, he appears to have been born in that area. There were other early Acrees in colonial America, who may have been related to the above three men. They lived mainly in the Tidewater area of Virginia and appeared in county documents of the late 17th and early 18th centuries. Their surnames were variously spelled at the time - handwritten or later transcribed as Acre, Acres, Acers, Akres, Akues, Ackers, Akers, Acrill, etc. - inconsistently for the same men, as it suited them or the officials who phonetically recorded their participation in contemporary events, including court appearances and property transactions. Regarding the two earliest Acrees appearing on the map: William of Lancaster Co., who died in 1688, was not an Acree progenitor because his descending male line ended with the death of his only son, William of Richmond Co., according to court records. William of Essex Co. (created from Old Rappanahhock Co.), who died in 1702, is the claimed ancestor of an unrelated Akers family line through a son who was also named William. DNA evidence accumulated by the project indicates that most, if not all, Acree immigrants to America came from the British Isles, though few of them appear in ship passenger lists. Finding them by keyword in computer records is complicated by our surname's unfortunate equivalence with the common word for land measurement (acre). An analysis of available birth records in the British Isles from the early 17th century to the mid-18th century indicates that the Acree surname was fairly common in Britain. Those records, like those in colonial America, never used the spelling Acree. Instead, our surname was written or later transcribed in more than two dozen different ways, including Acare, Accore, Ackares, Ackre, Akers, Hacker and, most commonly, Acres. There is, of course, no certainty that the men having those names were closely related, but the men living in the same geographic vicinity probably were. Their birth records were strikingly extant in the English counties of Berkshire, Hertfordshire, Kent, Lancashire, London and Norfolk. So, it's likely that, before they left for America, Acree emigrants resided in one or more of those counties, which are highlighted on the map below. There is good reason to focus particularly on Lancashire, because there is substantial genetic/genealogical evidence that our Acrees came from the English/Scottish "borders" area, within the huge influx of "Scotch-Irish" (Scots-Irish) immigrants who began to reach American shores in the second decade of the 18th century. Focus on Lancashire also coincides with the possibility that these Acrees' forebears may have derived their surname in association with the Dacre baronial land holdings that existed in adjacent Cumbria. For discussion of that possibility, see Origin of the Acree Surname webpage. Acree family lore has often asserted a Scots-Irish background, despite the inconvenience that our surname (however spelled) is normally excluded from Scots-Irish surname lists. Many colonial Americans who considered themselves Scots-Irish were actually descendants of English folk who lived in the long-disputed "borders" area, where the contentious Scots-Irish originated before many of them famously moved (or were removed) across the Irish Sea to northern Ireland. Focusing particularly on William Acree of Hanover Co., Virginia (the progenitor of most Acrees living in the U.S.), he was almost certainly a British borderer who, as a young man, arrived with companions in the post-1715 Scots-Irish emigration wave. The surname of his bride, Elizabeth Willis, is considered to be Scots-Irish. Hanover Co., moreover, was a "seed" area, where borderers gathered before they or their offspring migrated south - to or through North Carolina. Several William Acrees (of various surname spellings) were born in Lancashire during the relevant 1690-1715 years, any one of whom may have emigrated to Virginia and become William of Hanover Co. The most likely prospect was the William "Ackers" who was born in Prescot, Lancashire, in July 1712 to John and Deborah Ackers. He may have been the William "Hacker" who arrived in Virginia in 1730. Looking back into unrecorded history, nearly all of our project participants have Y-DNA profiles ("haplotypes") that pertain to a genetic clan ("haplogroup") designated R1b, also known as M343 for its defining "SNP" mutation. R1b is the most common male haplogroup in western Europe and is thought to have arrived there from the Eurasian steppe some 5,000 years ago with the spread of the Yamnaya shepherd and subsequent Corded Ware cultures that largely displaced the earlier agricultural population. Haplogroups are fascinating from anthropological and early historical perspectives, but have limited significance for individuals living today, because they focus upon a minute part of one's total ancestry, the part that is shown along the very top of everyone's family-tree chart - for most of us, our strictly Acree lineage. Each of our full family trees includes millions of ancestors (with millions of duplicates), as they extend back into the years when the major haplogroups evolved in relative isolation. Since then, humanity has become broadly inter-related. An important aim of this project, however, is to discern when our early Acree ancestors arrived in the British Isles and where they have lived. Haplogroups are relevant to that pursuit. Improved definitions are gradually distinguishing hierarchical sub-divisions called "subclades" that have emerged, like branches on a tree, within the past few thousand and now hundreds of years, allowing them to become increasingly applicable to genealogical research. Further testing among S6915 descendants has revealed three modern SNPs possessed by the Virginia Acrees that are less than 400 years old. One originated in William of Virginia himself or in one of his near-term grandfathers, enabling us to verify Acree descent from William by simply testing for the presence of that SNP alone (A2156). Another originated in William's son, John Sr. (a remarkable find), enabling us to verify descent from him specifically through a test for that SNP. The third originated even more recently, probably in the 19th century. Thus, SNP testing within our project has progressed far beyond assignment of participants to ancient haplogroups and their more modern but still-sizable established subclades. We have succeeded in discovering SNPs resident in the Y-chromosomes of relatively small groups of Acree men who belong to very exclusive subclades. An article published in the Journal of One-Name Studies tells how we accomplished those discoveries. Yet, the search for early origins in the British Isles and earlier in continental Europe, continues. Other men belonging to the S6915 subclade are known to descend from patrilineal Scottish clans who lived in the western English-Scottish border area during Medieval times - providing further support for this long-presumed intermediate origin of the Virginia Acrees. S6915 is not believed to have been associated with the early inhabitants of the British Isles (Celts, Picts, etc.) or with the Germanic mercenaries whom the Romans brought with them to England. It more likely arrived in Britain after the Roman withdrawal - with the Angle/Saxon/Frisian invaders in the 5th-8th centuries, with the Norse/Danish Viking invaders in the 9th-10th centuries, or with the Norman invaders in the 11th century. There is an intriguing possibility, however, that an early ancestor of the Virginia Acrees emigrated from Scandinavia, based upon the discovery of Z159 lineage in both Norway and Sweden, which would fit the following scenario. In the early days of population genetics, several large-scale studies focused on six Y-DNA STR markers and defined a specific set of their values as the ubiquitous Atlantic Modal Haplotype (AMH). Within this context, Stephen Oppenheimer, in his book, The Origins of the British, assigned the label "R1b-8a" to the set of STR values that our project has identified as belonging to the Virginia Acrees, which differs in two instances from the AMH. 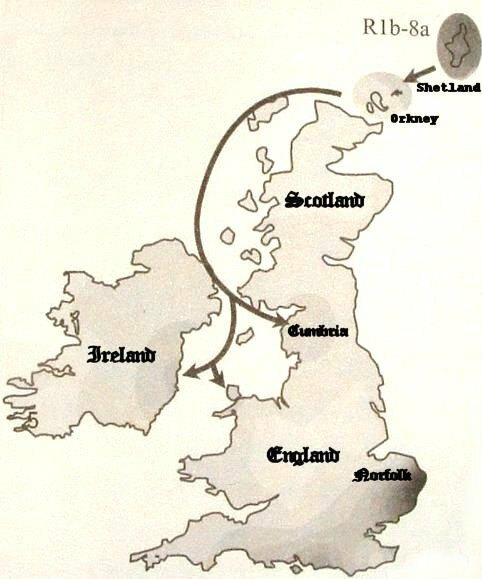 He characterized that haplotype as a "uniquely British" cluster with early origins in the Shetland Islands that apparently flourished in the form of raiders who, acting much like contemporary ninth-century Vikings, though genetically unrelated to them, spread their seed from Shetland down the west coast of Britain and around to Norfolk during the Dark Ages, as illustrated by his map below (modified here). It suggests that the patrilineal forefather of the Virginia Acrees, whatever he called himself, strode into the western English-Scottish border area in the latter years of the first millennium AD. Historical maps employed by the People of the British Isles Project lend support to this scenario, showing that invaders of Scandinavian descent left homesteads in the Shetland/Orkney Islands to settle in Cumbria during that turbulent era. Our minority project participants, who descend from William Akers (1726-1765) of Frederick Co., Maryland, or match his haplotype (all called the "Maryland Acrees" within this project for convenience), also belong to the parent haplogroup R1b, but to a different, more populous subclade designated P312. Their (much-abbreviated) descent has been through: M343>M269>L151>P312>L21>DF13>Z251>Z16943>BY3970. Our project is able to verify descent from William of Maryland by testing for the possession of a subsequent, modern SNP, which is included in the diagram below (A9516). It has been speculated that the P312 subclade separated from U106 along the upper Danube River in the vicinity of Vienna/Budapest about 5000 years ago. So, while the forefathers of both the Virginia and Maryland Acrees are believed to have lived in the English/Scottish border area in Medieval times, before they emigrated to America, they were unrelated to each other there, having descended from a shared ancestor who lived a few thousand years earlier in continental Europe. When their descendants subsequently adopted variants of the Acree surname in Britain, they did not do so as kin. The forefathers of the Acra, Acord and other Akers participants in our project were similarly unrelated in Britain. Our Akers participants who descend from William Akers of New Jersey (1650-1715) belong to S1194, a relatively small "sister subclade" to U106 and P312. Our project is able to verify descent from William of NJ by testing for the possession of the modern descendant SNP BY125155. Our Akers participants who descend from patrilineal English ancestors who did not emigrate to America belong to the distantly-related DF49, DF81 and DF110 subclades of P312. Our Acord participant, who descends from Cornelius Acord (also known as Cronamus Acre - c1760-1839), has not yet been SNP tested but predictably belongs also to the R1b>M269 haplogroup. Our two participants who descend from Jacob Acra (c1710-1772) have not yet been SNP tested but predictably belong to an entirely different haplogroup (Haplogroup I). Their pre-historic descent is predicted to be: I>M438>L460>M436>M223>Z185>Z180>L1198>Z166. On the basis of accumulating SNP/haplogroup historical evidence, the map below displays the speculative multi-millennial northwestward migraton of the succesive patrilineal forefathers of our majority U106 Virginia (VA) Acrees (. . .) and our minority P312 Maryland (MD) Acrees (- - -) across continental Europe to their coincidentally common Medieval settlement in the English/Scottish border area. Because their respective routes through the mountainous terrain and intervening seas are entirely unknown, this representation is necessarily schematic (employing straight-line progression). As more widespread SNP testing and analysis leads to new discoveries and interpretations, it is expected that the early European origins of our participants will be assigned to increasingly specific geographical locations and timeframes. Impressively, the ancient remains of an honored warrior wearing a golden pendant of Roman origin, discovered in 2005 within an elaborate personal grave in northeastern Slovakia, were determined in 2018, following a decade of archaeological and genetic enalysis, to be those of a Germanic tribal chieftain who died in his early twenties about 400 AD and descended from the S6915 subclade with which the Virginia Acrees are associated.